Chavonne Stewart founded Living 4 Purpose Enterprises LLC. L4P provide the roadmaps to make your dreams become your reality! L4P offers various services from business consulting, life coaching and resume revamping. In addition, Chavonne is an accomplished self-published author of the children’s books series, The Adventures of Amilya Rose. Her writing goes beyond just her books, she established her first blog in 2014 called “Real Conversation 4 Real People,” (justtalk4u.com) is an exploration of culture through conversation, without the restraints of political correctness. Now, equipped with applied knowledge, practical experience & CEO status…Chavonne is a visionary and strategist willing to work with all individuals who desire to reach the next level…Living4Purpose! Her goal is to EducateU! EmpowerU! & Embrace your Dream! Building Leaders & Entrepreneurs one step at a time. 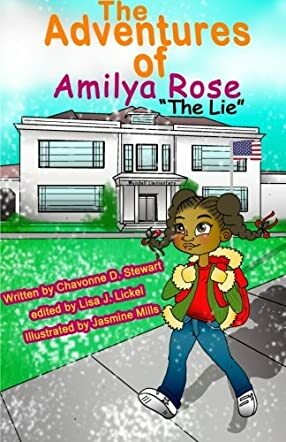 The Adventures of Amilya Rose: The Lie by Chavonne D Stewart is the story of eight-year-old Amilya Rose Patterson who is a third grade student at Wyndell Elementary. Her father, Lewis Patterson, works for a big company downtown, her mother, Gwendolyn Patterson, owns her own interior design firm, and her brother Caleb is four years old. Amilya thinks she is a big girl now as she dresses herself and makes her bed all by herself every day. She is excited because she is now going to walk from school to daycare without a parent pick-up, although she knows her mother does not approve of it. Will her parents find out Amilya has been lying to them? The story conveys the message of being honest and how telling lies is wrong. It also teaches readers to obey their parents as they are always concerned about the safety of their children. The illustrations are lively and colorful and they breathe life into the scenes and the characters. It's a good bedtime storybook for kids and can be used for read aloud sessions in classrooms and school libraries. Amilya's character is real and relatable and what she does is something which many kids do; lying and disobeying their parents. Books like this are good for children to help them understand the message or the moral clearly via a story and expressed with the help of illustrations.